This is a familiar reminder that the manghihilot usually tells a person after a Hilot session. Most times, people just meekly obey, without knowing exactly why they are being temporarily banned from being splashed on with water. Hilot newbies might feel a bit uncomfortable, not being used to the cloying warmth brought about by the oil applied by the manghihilot and letting it linger on the skin for several hours—sometimes, even until the following day. Dr. Bibiano Fajardo, an albularyo (traditional healer) who has been healing with Hilot for over forty-five years, finally sheds light on the mysterious reason behind this admonition. 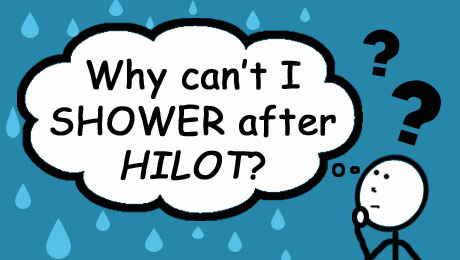 The reason why people are forbidden from taking a shower after Hilot? “It will retard the healing process,” Dr. Fajardo says. Hilot, being essentially a method of healing, is applied in order to correct problematic muscles and nerves. The hardening of a muscle means that there is a problem with the conductivity, or the flow of electrical energy, in the nerves. A good manghihilot concentrates on the affected areas to align these muscles and nerves and bring them back to optimal functioning (the number of Hilot sessions needed would depend on the severity of the condition). Dr. Fajardo explains that once the stiffness in the muscle is released and the nerve regains its original functionality, there is usually a change in temperature in the affected area. This could mean the warming up of a previously “cold” area, or the return to normal temperature of a previously “hot” area. For healing to take place, the temperature in the areas worked on by the manghihilot should be kept warm for a certain period after the Hilot session. That innocent-looking bottle of coconut oil used by the manghihilot actually serves several purposes aside from its obvious function of allowing the manghihilot’s strong hands to smoothly glide over the skin—it cleans the pores, keeps the affected areas warm, and also provides a measure of protective “waterproofing.” Keeping water away from the skin is critical, because water cools down the body and counters the healing effects of Hilot. Showering with warm water is also not recommended, because when water droplets evaporate, they still give off a cooling effect, especially when there is a breeze. Ideally, you should allow a period of around 8-12 hours after your Hilot session before taking a shower, explains Dr. Fajardo. This is roughly the amount of time our bodies need to stabilize and return to “normal” (but improved!) functioning. However, when you are pressed for time, the barest minimum is between 3-4 hours, to give your muscles at least some time to relax. But what if you are meeting the President and really, really, really need to take a shower shortly after your Hilot? In such “urgent” cases, Dr. Fajardo advises that you should apply a layer of oil on the skin for further waterproofing and then take a really quick shower. That way, the oil will further protect you, and the water won’t have much time to alter the temperature of your body and retard the Hilot healing process. Want to experience the healing benefits of authentic Hilot? Visit ATHAG at 63 San Rafael St., Brgy. Kapitolyo, Pasig City. For inquiries or appointment schedules, please text or call (0922) 884 4568. I wonder what scientific basis the above recommendations were based on. Most doctors would agree that it’s alright to take a shower after a massage, be it “hilot”, “Swedish”, or other forms of massage. Hilot, the Filipino healing tradition, follows a very different set of philosophies, practices, and principles from conventional western medicine. Since it follows a very different paradigm, it is common to hear widely divergent advice from Filipino traditional healers (albularyo/ manghihilot) and western medical practitioners. While most Filipinos think that Hilot is only a way of treating sprains and broken bones, it is actually an entire health system, with its own processes and methods for dealing with all kinds of health problems. Don’t ask if you don’t believe in advices. Aside from retarding the healing process, will a hot shower after an hour-long whole-body hilot session have any adverse or bad effect? Your question is right on target—actually, apart from retarding the healing process, taking a shower after a hilot session adversely affects nerve conductivity. Hello! My father just had a Hilot session and after that session (maybe after 1 hour) he took a bath. Later on he started to throw up. Is taking a bath after Hilot session can make you vomit? Is there any explanation about this? Thanks! Thank you for visiting our website on Hilot. May I ask why your father had his Hilot session? If your father had Hilot for digestive system issues, it is possible that he vomited because of the condition he already had. Also, where did you father have his Hilot? This is important because nowadays, there are many establishments and people claiming to do “Hilot,” but what they are doing is actually not Hilot, but massage. In traditional Hilot, we follow rules that are grounded in science to ensure that we help heal the client, not upset his body. Another point to consider is, does your father often take a bath or shower when he is tired? For example, after working, walking, etc? If he does, it is also possible that the nerves to his digestive system are affected already, and the shower made it worse. Of course, without knowing and seeing your father’s condition, we cannot really say for sure why he vomited. Please do monitor his condition and bring him to a health care practitioner if you notice anything that causes you to worry. If you have Hilot for the back, even if it is just a quick session, the ideal is still to refrain from getting wet at all for the following 12 hours. However, if you really, really need to get wet, you can apply oil first then just wash up quickly. That’s BS. There’s no scientific explanation on that. You can take a shower after a massage. Most doctors would agree that’s it’s okay to take a shower after a massage “hilot”. Please! Stop misleading people. If you read the article, you’ll notice we never mentioned massage. That’s because Hilot is VERY DIFFERENT from your usual massage, and SHOULD NOT be lumped together with it. In fact, only those who do not know what traditional Hilot truly is and who have not experienced it will mistake it for massage. Doctors follow the western school of thought when it comes to their practice of medicine; in Hilot, we follow an eastern paradigm which is, again, VERY DIFFERENT, in terms of perspective and approach to healing. We know that people have the right to their own opinions, and of course, you are entitled to yours. But next time, before giving any value judgments, please ensure that you know A LOT about the topic, and not just based on hearsay, but on your own personal experience. I agree. And there is nothing to lose following what is recommended for your own safety. Hi. I’m currently having my postnatal hilot sessions. The manghihilot told me not to take a bath for the entire duration of the hilot sessions, which I think is about 10 days. Can I follow the 8-12 hours rule? I have to go out from time to time for check-ups, so I really want to take a bath. Thank you very much. Thank you for continuing to support traditional Hilot.